Most personal Computers (PCs), servers and work stations uses DRAM memory chips mounted on small, removable memory modules. Originally produced as single-inline memory modules (SIMMs) with memory organized into sizes such as 256K×9 and 1M×9, more recent memory modules use wider I/O. Thus 128M×64 memory modules are common-place today. Additional I/O is facilitated by using dual-inline memory modules (DIMMs), such as 168-pin,184pin 240pin modules etc.. The huge demand for memory modules has resulted in a wide variety of systems requiring different type of memory form-factors resulting to extremely crowded and competitive industry that is very cost sensitive. Testing costs have risen significantly, especially for higher-density modules and more memory modules must be tested with many types of memory testers. Specialized, high-speed memory test equipment are needed to interface to the various types of memory module, do you wonder how test engineers are able to overcome the problem of maintaining the different types of text fixtures to test SIMM,DIMM,SODIMM, Mini-DIMM,MicroDIMM.....etc. This articles offer some insight to the few alternatives interface board for testing memory module for open circuit, short circuit, functional failures, out-of-spec parameters, etc. CST, Inc. (www.simmtester.com), has created a all in one test solution to allow the use of DDR3 SODIMM converter on a standard long DIMM DDR3 tester. The CST SP3000-1333Mhz DDR3 tester detects a jumper signature on the SODIMM converter and switches itself to SODIMM test mode automatically. The memory tester is capable of detecting shorts,open and functional failures on the SODIMM module. In short summary, the CST DDR3 tester, with its clever design accommodates the testing of DDR3 240pin long DIMM and 204pin SODIMM all in one unit. Many other types of converters is available for testing the various type of module pin-out. CST offers the following types of converters that can be tested on the SP3000 memory tester or using the standard motherboard system. 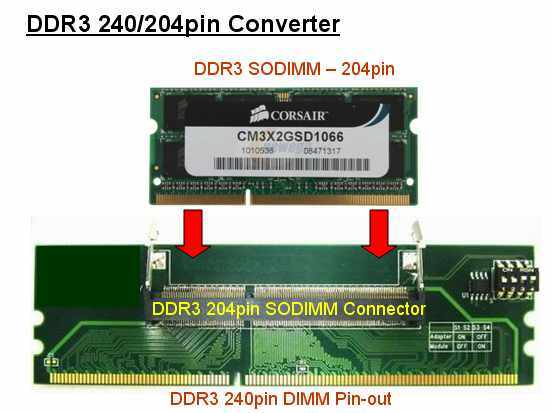 This converter enable the SP3000 DDR3 memory tester to test the DDR3 204pin SODIMM module like a regular DIMM module via a specially routed 240pin DIMM connection. 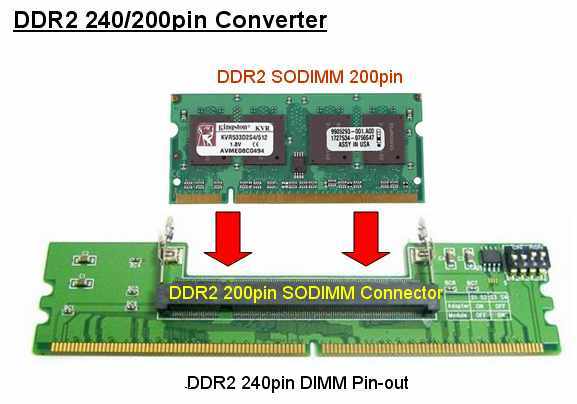 * The 240 DIMM pinout connects direct to the DDR3 tester memory controller. 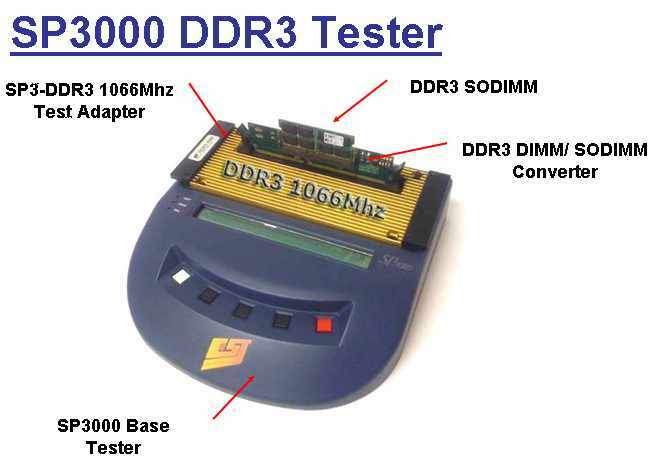 This converter enable the SP3000 DDR memory tester to test the DDR 172pin Micro-SODIMM module like a regular 184pin DIMM module via a specially routed 184pin DIMM connection. 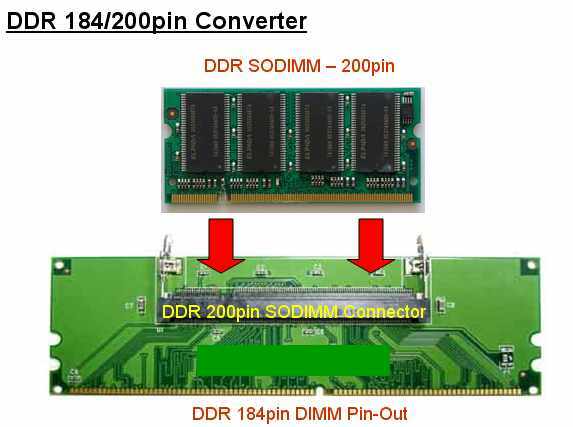 * The 184 DIMM pinout connects direct to the SP3000 DDR tester memory controller. 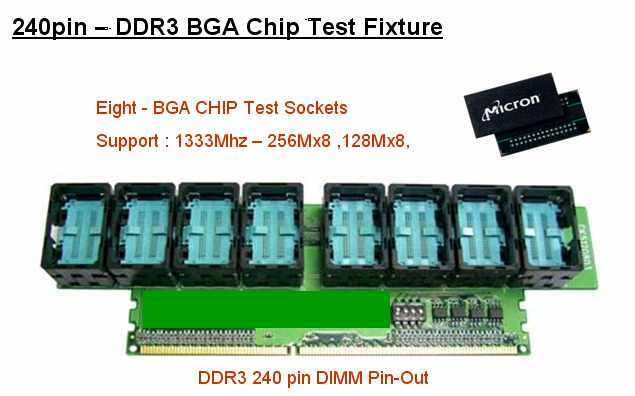 This DDR3 BGA fixture enable the SP3000 DDR3 memory tester to test DDR3 BGA chips on a specially modified DIMM module with added BGA test sockets. 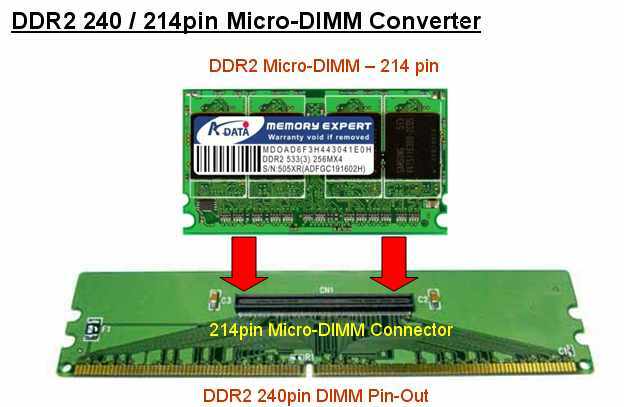 * The 240 DIMM pinout connects direct to the DDR3 tester memory controller. 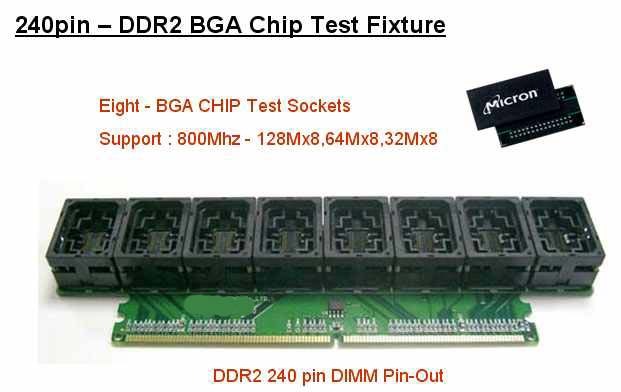 This DDR2 BGA fixture enable the SP3000 DDR2 memory tester to test DDR2 BGA chips on a specially modified DIMM module with added BGA test sockets. 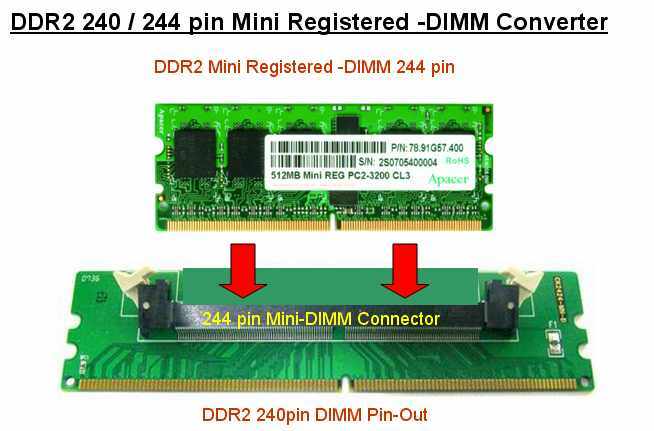 * The 240 DIMM pinout connects direct to the DDR2 tester memory controller. 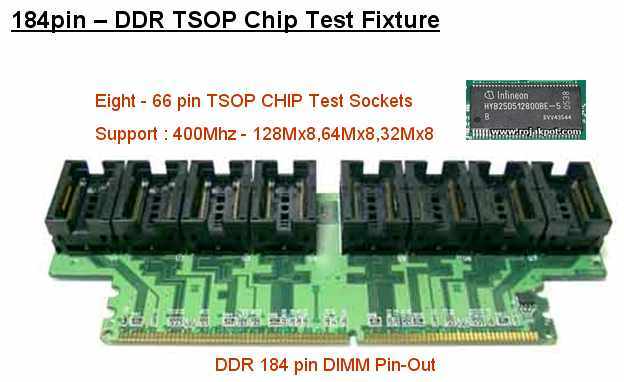 This DDR TSOP fixture enable the SP3000 DDR memory tester to test DDR TSOP chips on a specially modified DIMM module with added TSOPchip test sockets. 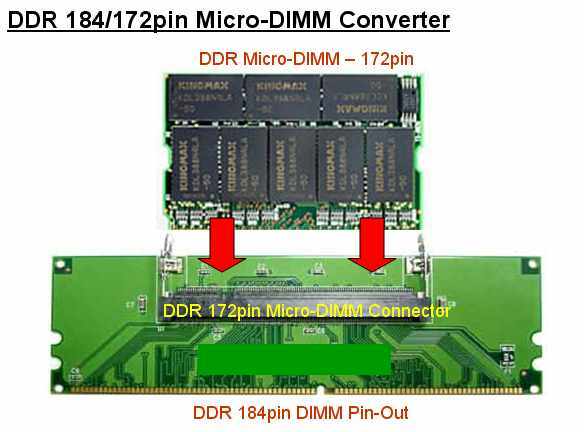 * The 184 DIMM pinout connects direct to the DDR tester memory controller. 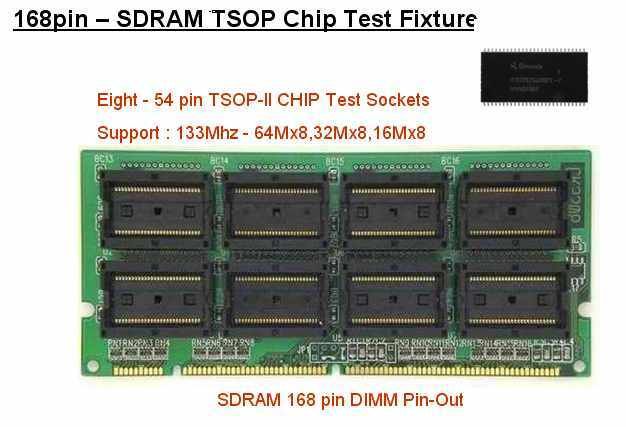 This SDRAM TSOP fixture enable the SP3000 SDRAM memory tester to test SDRAM TSOP chips on a specially modified DIMM module with added TSOP chip test sockets. * The 168 DIMM pinout connects direct to the SDRAM tester memory controller.